Rodial Super Acids x-Treme Acid Rush Peel: Unveil a fresh, even and a more luminous complexion with this ultimate resurfacing facial peel to completely rejuvenate the look of skin. A potent combination of azelaic, glycolic and lactic acids effectively exfoliate and retexture, revealing a new layer of skin with the appearance of imperfections and fine lines and wrinkles reduced. A complex of pronalen fruit acids™ and powerful prozymex® enzymes brighten and refine, reducing the appearance of age spots, skin blotches and uneven skin tone ($94, Nordstrom.com). 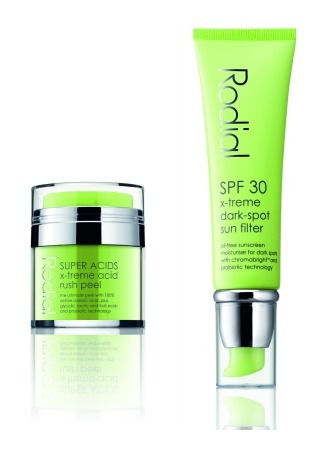 Rodial Super Acids SPF30 x-treme dark-spot sun filter: An ultra-defensive sunscreen moisturizer which offers broad spectrum protection against harmful UV rays and combats the visible signs of aging. This easily absorbed, multi-beneficial formula contains chromabright™ to correct the appearance of dark spots and uneven skin tone and help prevent further damage ($56, Nordstrom.com). iS Clinical Hyperpigmentation Kit System contains 4 hydroquinone-free lightening products that are gentle yet effective in treating hyperpigmentation. The iS Clinical Hyperpigmentation Kit System Contains: iS Clinical Cleansing Complex – 6 oz., iS Clinical White Lightening Complex - 1.25 oz., iS Clinical White Lightening Serum - 1 oz. , and iS Clinical SPF 25 Treatment Sunscreen – 3 oz. Check out before and after pics here. Find your local retailer here: iSclinical.com or Amazon.com.